Here are complete instructions and advice on how to store wedding cake to celebrate your first anniversary. Learn the anniversary cake storage process and what not to do when storing cake, like freezing it in a just a plastic container unprotected. The wedding tradition is to save the top tier of the wedding cake until the first anniversary. The challenge here is to keep the anniversary cake fresh for a whole year. The invention of refrigeration/freezing has made this possible. The freezer burn and bad taste that used to be challenges are no more! The sharing of the wedding cake on the first anniversary can certainly be a romantic event. However, if the cake is sour it could ruin the moment! Proper cake storage will add to the romantic experience. Here are the step-by-step instructions on how to store wedding cake. 1. Remove any cake toppers or decorations that are not edible. 2. 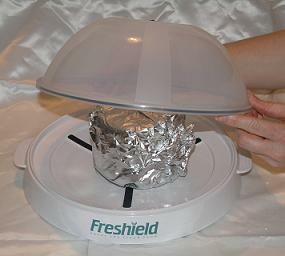 Place the cake on a plastic plate or wrap a cardboard bottom with aluminum foil. If your cake is already on cardboard wrap it in foil so your cake doesn’t taste like cardboard. 3. For butter-cream, place the wedding cake in the freezer for about an hour to let the icing harden. This will allow the cake to maintain its shape and prevent the plastic wrap from sticking to it. Note: For fondant covered cake you can skip step 3. 4. Remove from the freezer and wrap the wedding cake or anniversary cake in plastic cling wrap several times. Try to get snug to remove any air. Don’t worry about using too much; wrap it up good and tight. 5. Use aluminum foil and wrap the cake two or three times covering all sides at least twice. This will further protect your first year anniversary cake from freezer burn or bad taste. 6. Place your anniversary cake in a cake storage container by Freshield, vacuum seal by removing the air and then place into the freezer. You now have a very well protected piece a cake! The Genysis vacuum cake storage container can keep cakes fresh for up to 5 times longer than conventional methods. Prevent freezer burn and don't spoil your cake, or your anniversary. 7. The day before celebrating your anniversary move the cake to the refrigerator, leaving it in the cake container and allow to thaw slowly. A few hours before serving remove the wrapping and leave at room temperature. When you store wedding cake properly you can enjoy your anniversary without worry! Comment on how to store wedding cake. We always welcome new ideas or suggestions!